Study the astrophysics of Globular clusters in Extragalactic Systems. The aim of the project is to investigate the formation and evolution of globular clusters and their host galaxies. This problem is tackled using high resolution imaging from the Hubble Space Telescope, combined with ground-based imaging and multi-object spectroscopy with the Keck telescopes. 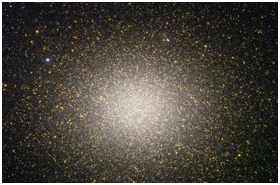 Globular clusters (GCs) are relatively simple stellar populations consisting of 104 to 106 stars and characterized, to first order, by a single age and chemical composition (Omega Centauri below). They are thought to be the oldest radiant objects in the universe and they orbit, usually in large numbers, around galaxies of all morphological types. As fossil remnants of the early environments out of which galaxies formed they are powerful probes of the processes of galaxy formation and evolution. Unlike single stars, GCs can be observed far beyond our Local Group of galaxies, providing clues about the early histories of different types of galaxies. Because they are relatively simple stellar populations, they are more easily modeled and understood than the unknown mix of stars of different ages and chemical compositions that make up the diffuse stellar population of galaxies.